Being charitable and being profitable do not have to be mutually exclusive. That’s what companies are finding by turning their excess inventory into donations that benefit charitable groups in their communities and beyond. For wholesalers, retailers and distributors, finding the best way to move unprofitable stock remains a challenge. They can discount or liquidate products, but that eats into profits and devalues their brand. What many savvy companies are doing instead is turning to product philanthropy—donating unwanted stock to charity. The move gets unwanted inventory off the shelves while also earning the company a healthy tax deduction. Companies that use a gifts-in-kind organization, a nonprofit that acts as a go-between for corporate product donations and nonprofits, can streamline the whole donation process. 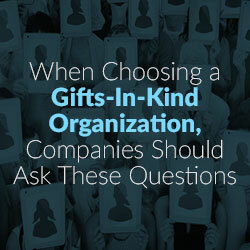 With a gifts-in-kind group, employees don’t have to spend time screening charities to find the right fit. The gifts-in-kind group does that for them. This is how it works. A corporation contacts a gifts-in-kind organization about donating products. Usually the company will start by completing some initial paperwork. 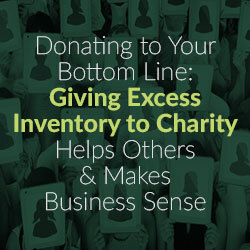 After that corporation becomes a recognized donor, it can contact the gifts-in-kind organization whenever it wants to dispose of excess inventory. Once the gifts-in-kind group approves the donation, the company ships it to a designated location where workers will sort and catalog it. In turn, when member charities need items, they browse through a catalog of products donated by member companies and choose what they want. The donor company will receive proper tax documentation when they make their initial donation. Once those products have been distributed, the gifts-in-kind organization will send additional documentation identifying the specific charities that received the company’s products. Deductions are equal to the cost of the inventory donated, plus half the difference between the cost and fair market-selling price, not to exceed twice the cost. Compare this to moving inventory via online auctions or liquidation agents and, for most companies, it’s a much better deal. Plus, it’s a lot less stressful and labor-intensive. Besides helping companies boost their bottom lines through time and tax savings, product philanthropy can help boost a company’s image as well. Donating products creates good will, thereby elevating a company’s image. By contrast, selling products at a discount devalues a company’s product and its brand. Gifts-in-kind organizations also help companies to be better citizens. Even the most motivated companies might have trouble carving out the time to promote good will and give back to their communities while still keeping their businesses afloat. Gifts-in-kind organizations make that process easier. They distribute products to qualified charities, who in turn distribute them to people in need. Finally, donating products helps make employees feel good about their workplace. Employees like working for companies that have heart. Seeing that their company is reaching out to help those in need is a great way to express that. There are several gifts-in-kind organizations operating in the U.S., and, like anything, not all are created equal. Companies will want to choose one that is easy to work with and has a roster of worthy charities. What types of charities do you serve? What types of products do you accept? Does my company’s products fit with what your member charities want? Are there limits on what size donations (large or small) that you accept? Is the donation process fast and streamlined? Will you provide me with detailed records of what I donated and what charities received it? There is no “right” time to start using a gifts-in-kind group. But the sooner a business starts using one, the sooner it will reap the benefits. Donating excess inventory will do more than just help trim a company’s tax bill, it also will help it operate more profitably. Getting rid of excess inventory, instead of letting it collect dust in a warehouse, will free up space for high-performing products. And it may even speed up order fulfillment, in turn, raising customer satisfaction. Finally, instead of leaving products to languish in warehouses or on store shelves, companies will put them into the hands of people who really need them. It’s a great—and easy—way to make a difference in people’s lives.